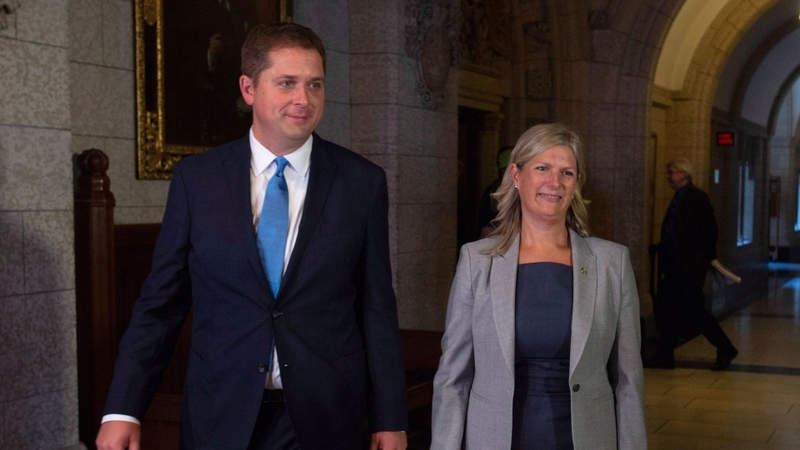 Ontario MP Leona Alleslev surprised many in announcing in the House of Commons on Monday that she was crossing the floor from the Liberal caucus to join the Conservatives, in the first floor crossing of this Parliament. Before physically walking across the floor where she was met by thunderous applause and handshakes, Alleslev said she was deeply concerned about the future of the country, citing economic and foreign policy concerns. Mr. Speaker, today I rise on a point of personal privilege. When I became an officer in the Royal Canadian Air Force, I swore an oath to give my life to serve Queen and country, to serve and defend Canada and the values for which it stands. When I left the military, I hung up my uniform but I never unswore my oath, and now I serve Canadians by representing them as their member of Parliament. I stand here today deeply concerned for the future of our country. After three years of hope and hard work, I find myself asking: Am I doing everything I can to serve the citizens of Aurora—Oak Ridges—Richmond Hill and my country? Canadians expect and deserve nothing less. The citizens of my riding and all Canadians need a government that delivers foundational change for the things that matter. The world has changed dramatically in the last three years. We find ourselves in a time of unprecedented global instability. We are seeing fundamental shifts in the global economy while trade relationships, international agreements, and defence structures are under threat. Canada faces a perfect storm of serious challenges at home and abroad. Here at home we see large amounts of capital investment leaving Canada while tax structures, federal infrastructure problems and politics prevent us from getting goods to market, deter companies from expanding and undermine our competitiveness. This is not a strong economy. Beyond our borders, our position remains vastly diminished. Our foreign policy is disconnected from our trade relationships and our ability to deliver on our defence commitments is undermined by politics. On the world stage Canada has yet to rise to the occasion. The world has changed and Canada must change with it. We do not have the luxury of time. We must recognize that foreign policy, trade, defence and our economy all depend on each other and cannot be viewed separately. As a former air force officer, a global business consultant at IBM, an aircraft manufacturing manager at Bombardier and a small business owner, I understand the role and impact of government actions on Canada's economy. To have a strong economy and a strong country we need strong federal leadership to rebuild our nation's foundations, tax reform, employment reform, a comprehensive foreign policy and a modernized military to reassure our allies and defend Canada's interests at home and abroad. My attempts to raise my concerns with the government were met with silence. It is my duty to stand and be counted. Our country is at risk. The government must be challenged openly and publicly, but for me to publicly criticize the government as a Liberal would undermine the government and, according to my code of conduct, would be dishonourable. After careful and deliberate consideration, I must withdraw from the government benches to take my seat among the ranks of my Conservative colleagues and join Her Majesty's loyal opposition, whose role it is to challenge and hold the government to account. The leader of Her Majesty's loyal opposition and his team have a firm grasp of the urgent issues we face as Canadians and the resolve to confront them and it is my duty to align myself with those values. I thank my Liberal colleagues, but my oath is to country, not party, and my sacred obligation is to serve my constituents. I ask the citizens of Aurora—Oak Ridges—Richmond Hill to continue to hold me to account as I serve and work with a new team focused on the challenges facing our nation and I say to all Canadians across this country not to accept the status quo; our country is at stake.